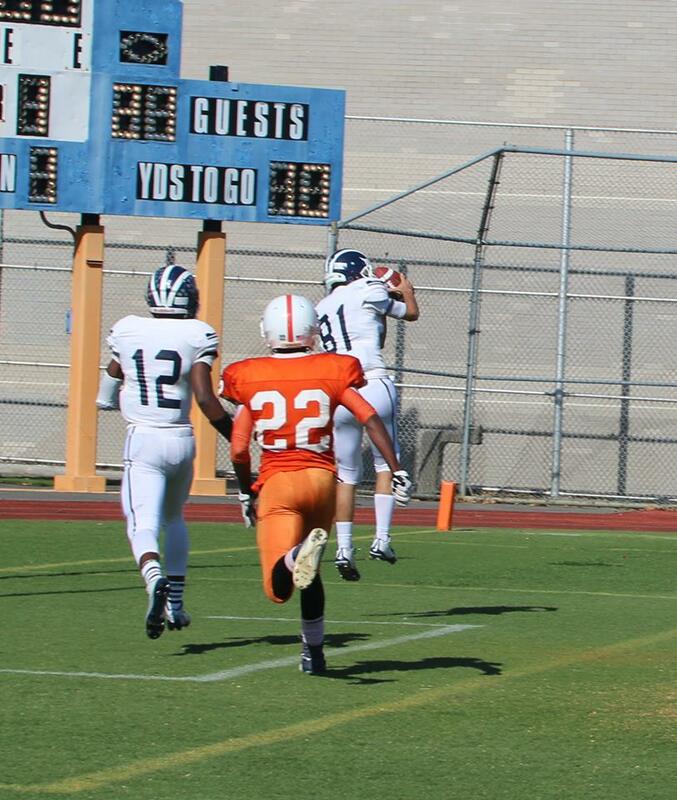 Andre Lebron (#81) catches the second of two TD passes from Elijah Rueda on Saturday in the 2nd quarter. Lebron was also a game Captain. 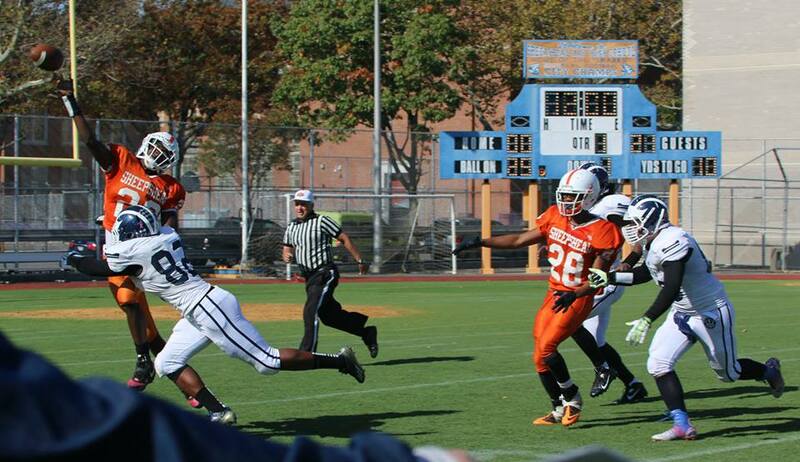 The Engineers defeated the Sheepshead Bay Sharks by a score of 31-8 during their homecoming on Saturday. Tech was up 28-0 at halftime after Elijah Rueda threw 3 touchdown passes, two to Andre Lebron and one to Lawrence Menyah, and a rushing touchdown for Brian Gill. Aloysius Ekezie (#60) breaks up screen pass. The Tech defense was outstanding, yielding only 87 total yards to the Sharks and shutting them out. Sheepshead Bay’s lone score came after a fumbled snap was recovered and run in for touchdown. 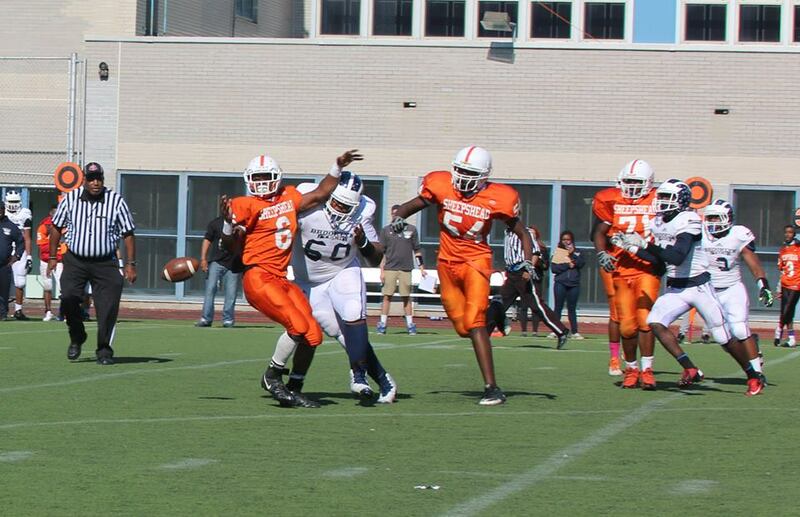 Brian Gill (#82), one of the top tacklers in New York City, pressures the Sheepshead Bay QB. The win brings Tech to 5-3 with two regular season games remaining, both of which are at home. 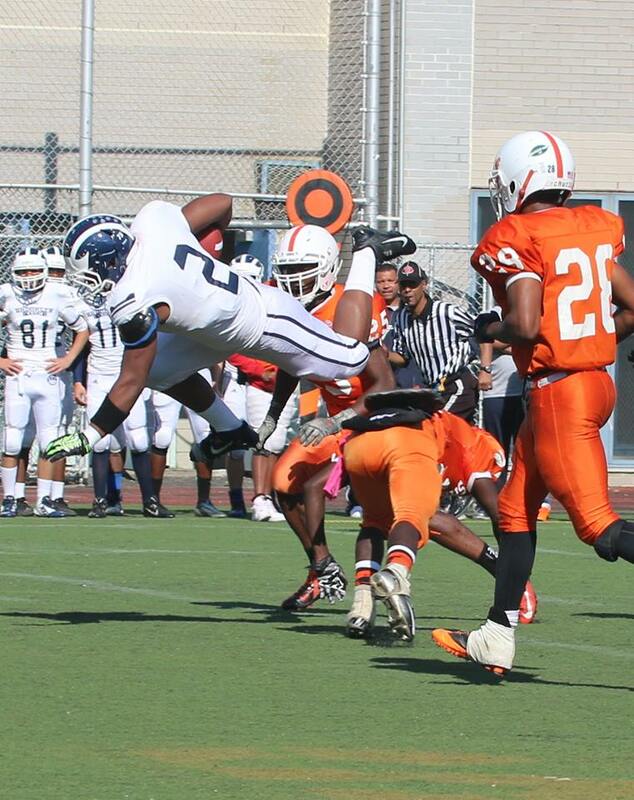 This week the Engineers will take on the #1 ranked Erasmus Hall Dutchmen. 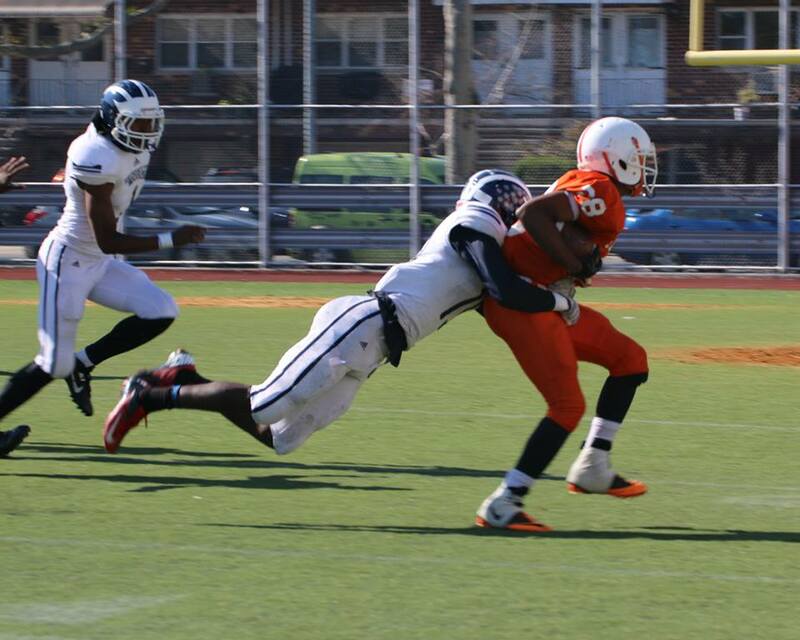 Lawrence Menyah (#19) and the defense held Sheepshead Bay to 87 total yards of offense. 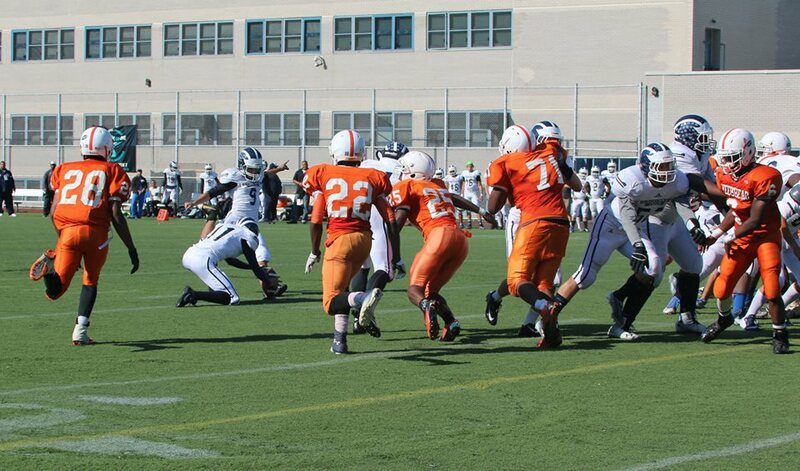 The Tech Junior Varsity was also victorious on Sunday against Sheepshead Bay by a score of 14-8. The JV is much improved and getting better each week. Nick Fuertes(#9) added to his point total with 7 points on Saturday, including this 25 yard field goal. Nathaniel Simmons (#2) had a career high in rushing with 57 yards on 6 carries. 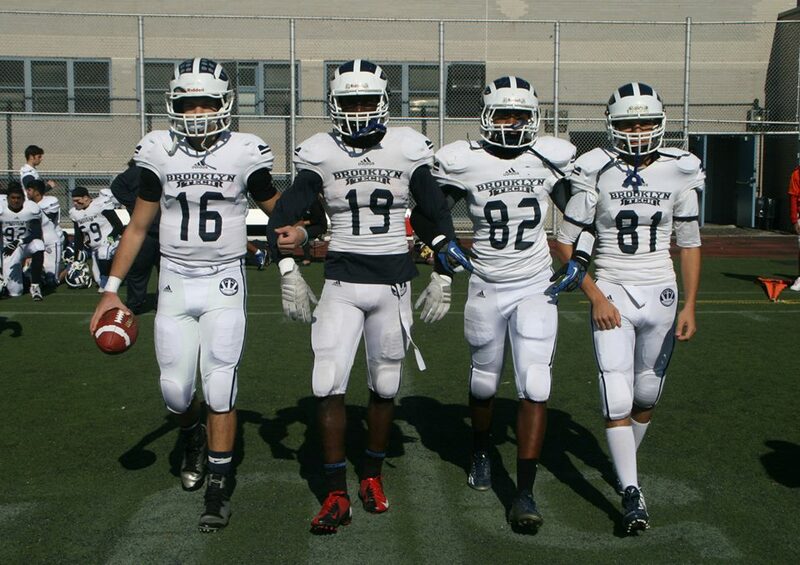 Team Captains Elijah Rueda (#16), Lawrence Menyah (#19), Brian Gill (#82) with game Captain Andre Lebron (#81). Reblogged this on sports aficionado 327.